This Post has already been read 1771 times. USRobotics introduces USR5639 56K USB Soft Modem that can helpful for your notebook that needs a modem. The compact size of this modem also makes it ideal for customers with point-of-sale or machine-to-machine system that require a compact dial-up fax modem. It supports plug-and-play operation and is compatible with V.92 and lower rates. As a soft modem, the USR5639 uses the processor of the host computer for high compression throughput. It can send and receive faxes through the computer while running multiple applications. The USB device is bus-powered and there is no need for an external power supply. It works with Windows XP/Vista/7. including 64-bit version and Windows Embedded POSReady 2009. 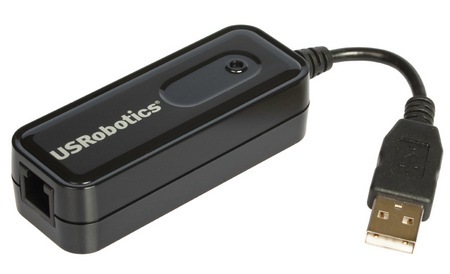 The USRobotics USR5639 USB 56K Soft Modem is priced at $29.99.